Yup, that's exactly what Yellen and company have really been enjoying doing for the last 6 months and counting, showing no intentions of quitting this addictive habit. We've been documenting this since the nonsense started many months back. With each passing FOMC meeting (already 4 have passed this year), and with every twist and turn of the macro economic grade book, the markets have rallied and tanked in a vomit-including clusterf***, in the process trolling traders and screwing investors' portfolios. Many are downright frustrated with this bulls***. Take a look at the S&P 500; you'll realize very quickly that U.S. stocks have gone absolutely nowhere YTD, but on a weekly and monthly basis, they have been more volatile (trading with huge swings) than the last couple of years! This is also true for most other markets in Europe and Asia. So, it is on this bombshell that we'll give readers a primer on what's to happen on the next 3 remaining event-packed trading days of this week. Central banks will be the main focus alongside the UK Brexit commotion (which we'll exclude for now). Central banks will take the spotlight as the U.S. Federal Reserve, Bank of Japan (BoJ), Bank of England (BoE), and the Swiss National Bank (SNB) are set to publish their respective monetary policy statements for the month of June and also announce decisions on interest rates and monetary policy measures (QE). Markets are anticipating that there will not be changes made by the aforementioned central banks. They are however expecting some renewed rhetoric (as usual) to fill the void that is the inaction with monetary policy. The 2-day long June Federal Open Market Committee (FOMC) meeting will conclude later today (Wednesday 2pm EDT) with the release of the Fed's monetary policy statement, and schedule of economic projections. Chairwoman Janet Yellen will subsequently deliver a prepared statement and address journalists' questions during a Q&A session. This will certainly be under the spotlight, and markets will be trigger happy should Yellen drop any hint as to what the Fed may do (promise to do, but won't actually commit to doing so) in the coming months. The Washington-based institution is not expected to deliver an interest rate hike today. 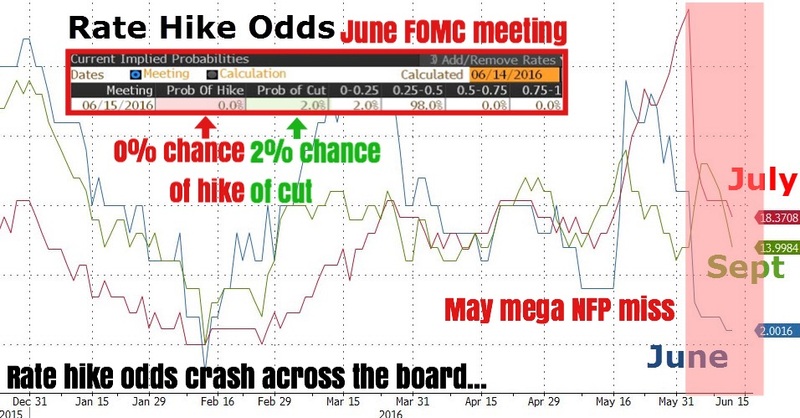 Recall that June rate hike odds were rejuvenated after the April FOMC minutes were published; but that was short lived as we've explained before. For the record, April's statement was not followed by a press conference, thereby leaving the markets hanging openly with little guidance. The FOMC statement released 27 April provided little clue on what the members of the Fed were thinking. The U.S. economy was seen improving, but after a rough start to 2016, markets have gradually pared back the number of expected rate hikes from 2 to 1 in 2016. As of today, the CME FedWatch tool is showing a 2% probability of a change in interest rates for this upcoming meeting. Other market based measurements imply a 0% probability of any hike at all. It is safe to say that the Fed Funds Rates will remain at 0.25-0.5% in June. According to the same CME indicator, the July FOMC event (no press conference) carries a 21% probability of a hike, September with 40%, November (no press conference) with 42%, and December with 59%. We note that this CME tool has usually tended to be on the optimistic side. FF futures are actually implying much lower rate hike odds for the rest of the year (see chart below). "The highly awaited June FOMC statement, interest rate decision, and press conference with Chair Yellen is now less than 24 hours away. As of last check, Fed Funds futures are implying a 0% probability that tomorrow's meeting concludes with rate hike. In fact, the dimensions have gotten so twisted that markets are actually discounting a 2% probability of a RATE CUT tomorrow. So yes, there is now a higher chance the Fed cuts than hikes tomorrow! Beyond that, rate hike odds for most of the remaining FOMC meetings in 2016 has slumped (especially that of July). With zero expectations that the Fed hikes in tomorrow's June meeting, attention will certainly shift to what Yellen will utter during her presser following the statement release. Markets are safely betting that the disastrous May payrolls report released 2 weeks ago would be significant enough to put a "live" FOMC on hold until we see consistent and solid improvements in macro. Enjoy the crappy ride for the rest of June!" It will also be interesting to see how the Fed's latest "dot plot" matches up against market expectations. As we've also highlighted and explained in previous articles, the window for a Fed rate hike is quickly closing — U.S. employment is clearly losing steam (proven by the gargantuan payroll disappointments in April and May, along with many other macro indicators), and the Fed certainly will not want to be hiking during the final stages and eventual countdown to the American Presidential Race/Election. Given that the Race will be in full swing come September, it is less likely the Fed will take the risk of adjusting interest rates then. This leaves the July and December meetings as the most likely candidates. Besides the Fed, the BoE will too be under the radar, publishing its monetary policy summary and minutes tomorrow (Thursday 700am EDT). This comes only one week ahead of Britain's referendum its EU membership. Interestingly enough, the English central bank has been accused of partisanship by many "leave" supporters, as it hasn't minced its words when issuing warnings on the negative effects of Brexit (what can be described as fear mongering). BoE Governor Mark Carney said last month that a Brexit event could trigger a "technical recession" in the UK. Apart from central banks this week, the remainder of June will also be packed with economic events. With so much uncertainty, realized volatility is expected to rise, as if they aren't already elevated.